Dave's new favorite plane: the T-Hawk from Toytronics. It's a lot like the Aerobirds you see in hobby shops, except that it has a normal tail instead of a V-tail, and it's a bit sturdier. Dave thinks it's the perfect beginner airplane. 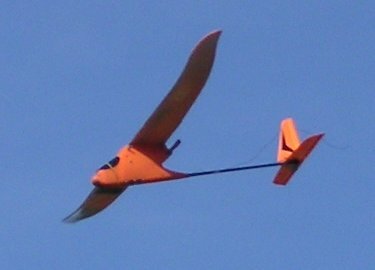 It has long wings, like a glider; a pusher prop, so you don't break the prop or prop shaft if you crash; an extremely sturdy plastic body, so it can dive straight into the ground and usually not break anything; and decent power. 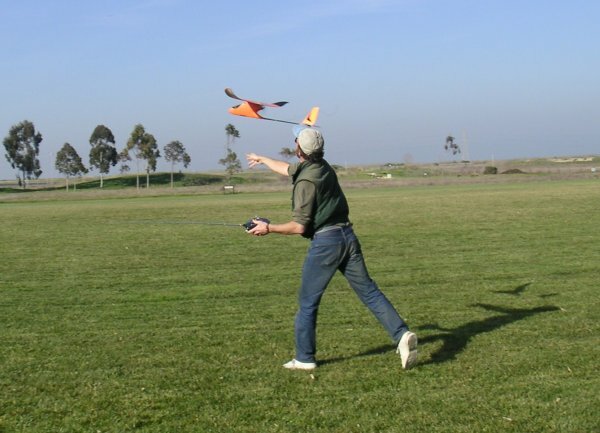 Normally it's sold as a ready-to-fly kit, but unlike the Aerobird type airplanes, you can also buy it without the transmitter, so you can use a normal transmitter which is usable on other planes as well. It also comes with quite a collection of spares, for when you do manage to break something. It has decent power, it's reasonably quiet, and in the air it's smooth, predictable, quite responsive without being twitchy (amazing that those tiny control surfaces do anything at all! ), and has an extremely gentle stall recovery. It comes with landing gear, and takes off okay, but now we're flying at a grass field, and hand-launching turns out to be easier than taking off from the ground was. And it's very easy to glide it in a long-smooth descent to a belly landing. Aerobatics: it can loop, if you let it gain some speed, and it can sort of do a hammerhead, though not too impressively. It rolls well enough from rudder input that I wonder if barrel rolls might be possible, though I haven't managed it myself. Dave doesn't care about most of this now; he's happy that it flies predictably, is fairly immune to wind, and survives crashes! Dave is so happy with his T-Hawk that he's become obsessed with them. He loves the company (great service, great spare parts availability) and he's ordering tons of spare parts, thinking about ways he can modify it (he wants to add ailerons), and now he's building one of their smaller planes, an E-Gull (a V-tail which normally comes with only one servo -- you can turn but can only use the engine to control altitude -- but he's putting two servos in it).